What's your summer like? My work schedule doesn't change during the summer; I keep the same hours and schedule year-round. Regardless, my mentality does make a shift this time of year; I feel more laid back and often relax our routines and schedules a bit. 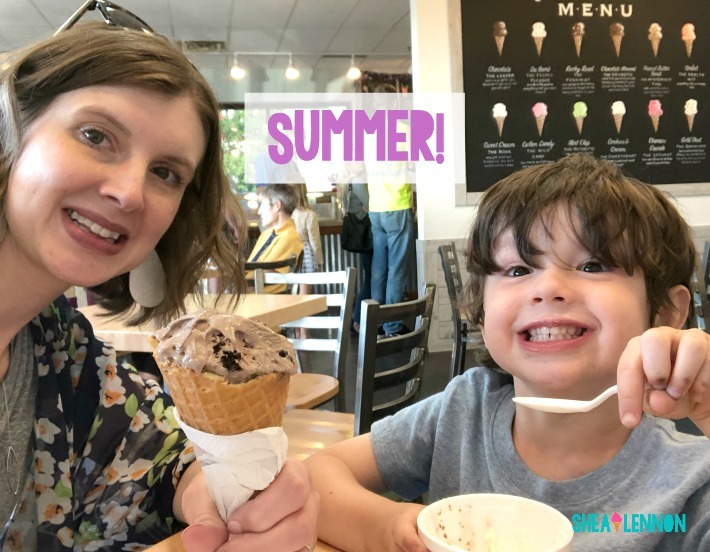 Especially since having kids, I try to embrace summer and make it feel special. 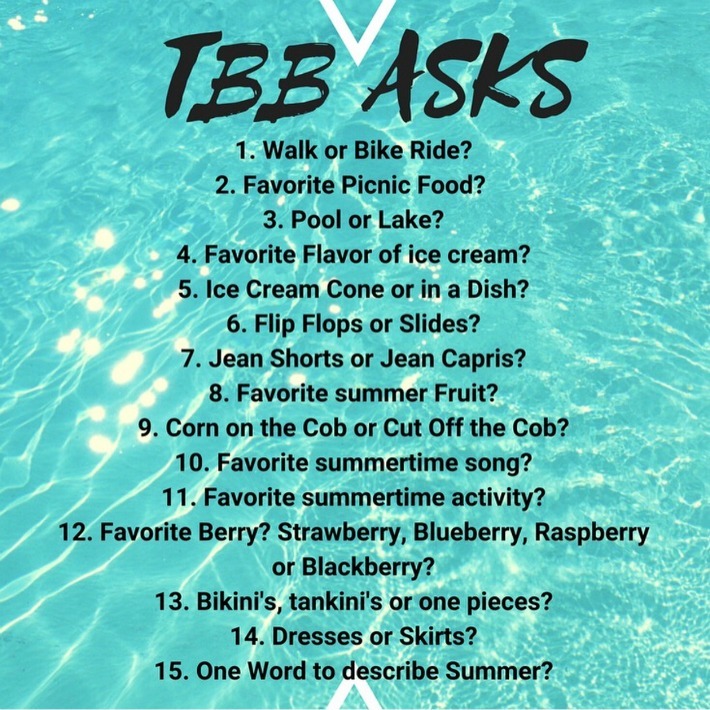 I'm joining The Blended Blog's TBB Asks questions that are all about summer today. 2. Favorite picnic food? Fruit. When I think of picnics the food always varies, but one thing that doesn't change is that we always bring some fruit along. Strawberries, cherries, watermelon, peaches... summer fruit is the best! 3. Pool or lake? I'd take either! We don't spend a lot of time at either though right now, but with Violet still being pretty little it's a bit easier to manage a pool visit these days. When I was growing up my family would rent a houseboat with a few other families for a few days during the summer and we always had the best time. I would like to do that when my kids are older as well. 4. Favorite flavor of ice cream? That is as hard as choosing my favorite book! The chocolatier the better is my motto, and I love an ice cream that's cram packed with stuff. Cookie dough, peanut butter cups, Oreos... yum. 5. Ice cream cone or in a dish? Cone please, as long as it's a waffle cone. And if it's a chocolate dipped waffle cone? True love. 6. Flip flops or slides? I have to choose? Please just give me all the summer shoes. For casual, around-the-pool or -yard shoes, I prefer flip flops. Otherwise I just want variety in my summer shoe wardrobe. 7. Jean shorts or jean capris? Jean shorts. I have some ankle-length cropped jeans but don't love true "capri" jeans on me. 8. Favorite summer fruit? Probably peaches, but strawberries and cherries are also delicious. But that relatively short window when you can get ridiculously sweet, juicy peaches... you can't beat that. 9. Corn on the cob or cut off the cob? On the cob with lots of butter and salt please! Bonus points if it's a flavored butter. 10. Favorite summertime song? I can't say I have one favorite, but the classic Summertime by DJ Jazzy Jeff and The Fresh Prince always makes me think of summer. 11. Favorite summertime activity? I like taking advantage of local events and festivals, and also visiting ice cream shops of course. 12. Favorite berry? Strawberry, blueberry, raspberry, or blackberry? Strawberry for sure. 13. Bikinis, tankinis, or one pieces? I'm a one-piece gal, and I'm very thankful that there are a lot of really cute one piece options these days. 14. Dresses or skirts? Um, both? See the shoes question above. :) I want variety in my summer wardrobe, so I like both. 15. One word to describe summer? Relaxed. I'd love to hear your summer picks as well. Link up with The Blended Blog or answer in the comments.